Bosnian Ponies, found in Bosnia and Herzegovina, are a member of the group of horses known as the Balkan breeds, and are thought to be descended from a cross between the Tarpan and Asian Wild Horses. Beginning in the 1900s, they have been selectively bred through a government-controlled breeding programs. The principle breeding center for many years was the Borike Stud in Bosnia. The state controlled all breeding stallions, while mares were privately owned. During the 1940s three stallions, Agan, Barat, and Misco, were used to improve the breed. 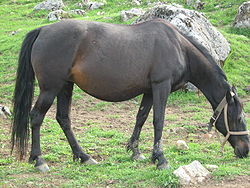 Agan and Barat resembled the Asian Wild Horse type, while Misco was a lighter type. Until the Bosnian War, there were strict standards, including performance tests, for stallions in order to assure the quality of the breed. This strict control resulted in a pony that was functional and had a variety of uses. Bosnian Ponies generally stands 12.1 to 14 hands high, and may be bay, brown, black, gray, chestnut or palomino in color. They have a heavy head with a straight profile, a short, muscular neck, fairly flat withers, long, sloping shoulders, and a deep chest. The back is straight and the quarters sloping. The legs are well-muscled, although short, with clean, broad joints and strong tendons. They are sure footed. The breed bears a strong resemblance to the Asian Wild Horse, although more refined due to the influence of oriental blood. They are hardy and tough, and generally docile and good natured in temperament, making them easy to handle and ride. They are easy keepers. The Bosnian Pony is used for light farm and draft work, packing, and riding. They are frequently used as pack animals in rough terrain unsuited for motorized vehicles.